Another shawl... but I am winging it at the moment- just cast-on and will see where it leads me. 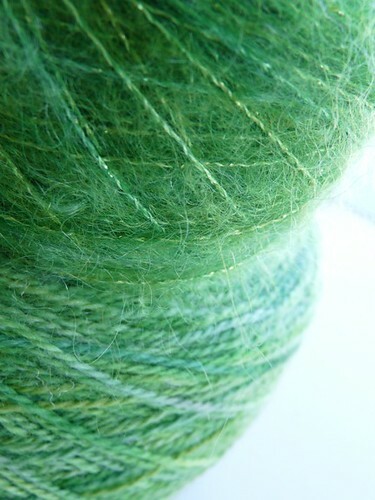 What I know for now it will be crescent shaped, swiss summer green and have some sparkles in it. That's a pretty shade of green! And I think everything should have a few sparkles! Have fun creating! Pretty shade of green too, I am a big green fan! And a shawl sounds fabulous!! my favorite color ! Soo curious to see what will come out of this threads and your fingers ! Love the head picture in your blog! love that - cast on and see where it leads! Given the beautiful color and texture of the wool and your creativity, I think it will lead someplace beautiful.